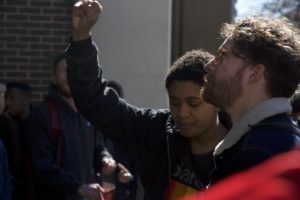 Christopher Hacker | The PHOENIX Student activists protested alleged racial profiling by Campus Safety March 2 following the arrest of Alan Campbell in Damen Student Center Feb. 24. 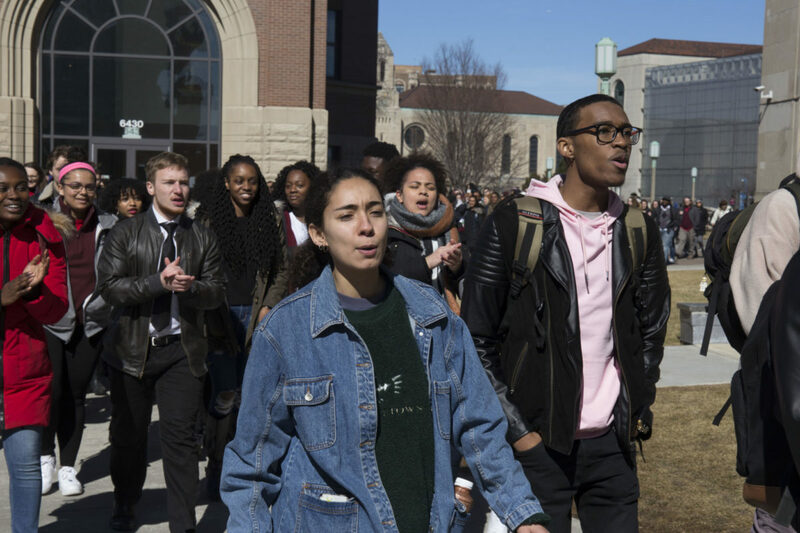 Following the recent arrest of Loyola student Alan Campbell by Loyola Campus Safety, a student movement called #NotMyLoyola has incited a dialogue about how Loyola addresses issues of race and inclusivity. With videos of the incident circulating on social media, accompanied by a student walkout and town hall, as well as a protest, what exactly are student’s rights when it comes to discrimination and demonstrating? Are you required to identify yourself as a student when asked by Campus Safety? In the video of the arrest of Alan Campbell, which is circulating online, a Campus Safety officer said a student could be arrested if she didn’t present her student identification. Students are required to carry a student ID with them at all times whenever on campus, according to Loyola’s Community Standards, the set of rules all students sign and agree to upon their enrollment at Loyola. If requested by a university official or emergency personnel, such as a Campus Safety officer, to present their student ID while on campus, a student must comply and present his or her student ID. What disciplinary actions come as a result of failing to provide student identification? If a student is unable to show their student ID immediately after being asked by university staff, then they may receive a warning, a $25 fine or 10 service hours. However, if a student refuses to provide his or her ID, then the student is subject to greater sanctions for failing to comply with university policy, as stated under section 201.10.c of the Community Standards. Common sanctions associated with failure to comply include fines ranging from $100-250, “educational experiences or projects” such as an in-depth reflection paper or service with a mentor, probation, suspension or dismissal from a residence hall or the university. Evangeline Politis, Loyola’s communication specialist, said Campus Safety has the same authority as other police forces and students must provide identification when asked, but didn’t give details about the consequences of failing to do so. discrimination, how can they report it? If students experience bias-motivated harm (e.g. discrimination based on gender, race, sexual orientation, etc. ), they can report an act through Loyola’s EthicsLine Reporting Hotline. EthicsLine is available both online over the phone at 855-603-6988. EthicsLine also provides the opportunity to make a report anonymously if the student desires, but this might limit the full extent to which the university can address the situation. EthicsLine can be used by both students and faculty at Loyola, and no university administrator, faculty, staff or student can intervene in an individual’s grievance filing process. What do I need to keep in mind if I wish to protest on campus? Time: Demonstrations must take place during the operating hours of their respective building or space on campus and aren’t allowed during final exam weeks, according to the Community Standards. Place: Demonstrations must be outdoors, unless in the Damen Student Center at the Lake Shore Campus or the Terry Student Center at the Water Tower Campus. Demonstrations can’t block the flow of people, traffic or the entrances and exits of campus buildings. Manner: Demonstrations can’t endanger the university community, violate the law, target or defame an individual, threaten or harass, invade the rights of others or prohibit the university from functioning. Sound can’t be amplified in a way that would interfere with classes or events on campus. Demonstrations can’t claim to represent the belief of the university, unless the dean of students sanctions it. Real life will be a shock for a lot of these students. Unfortunately Loyola isn’t preparing them for it.